At the age of fifteen years he began his studies and succeeded so well he was judged fit to teach philosophy and theology in a college of Alcala, and then at Salamanca. When his father died he returned to Villanova to dispose of his patrimony. He made his house into a hospital, keeping only what was needed for his mother, and gave the rest to the poor. At the age of twenty-eight he entered the Order of the Hermits of Saint Augustine at Salamanca, becoming professed in 1517. When ordained a priest three years later, he continued his teaching of theology, but also began to preach so remarkably well that he was compared with Saint Paul and the prophet Elias. The city was reformed, and after the Emperor Charles V heard him once, he returned and often mingled with the crowd to listen, finally making Saint Thomas his official preacher. He became Prior of his Order in three cities, then three times a Provincial Superior. His sanctity continued to increase, and he was nominated archbishop of Valencia in 1544; he had refused a similar offer sixteen years earlier, but this time was obliged to accept. After a long drought, rain fell on the day he assumed his new office. He arrived as a pilgrim accompanied by one fellow monk, and was not recognized in the convent of his Order when the two travelers came asking for shelter during the rain. He was obliged to reveal his identity when the Prior, who wondered where the awaited archbishop might be, asked him if perchance it was he. The new Archbishop was so poor that he was given money for furnishings, but he took it to the hospital for the indigent. On being led to his throne in church, he pushed the silken cushions aside, and with tears kissed the ground. His first visit was to the prison. 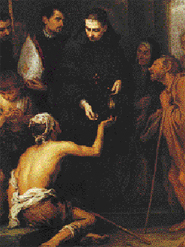 Two-thirds of his episcopal revenues were annually spent in alms. He daily fed five hundred needy persons, made himself responsible for the bringing up of the city’s orphans, and sheltered neglected foundlings with a mother’s care. During his eleven years’ episcopate, not one poor maiden was married without an alms from the archbishop. Spurred by his example, the rich and the selfish became liberal and generous. And when, on the Nativity of Our Lady, 1555, after one week of illness, Saint Thomas was about to breathe his last, he gave his bed to a poor man and asked to be placed on the floor. It has been said that at his death he was probably the only poor man in his see.